Puppy treats can be a fantastic way to supplement you pet’s diet, reward them for good behavior, and support your training efforts since food is a powerful intrinsic motivator. That said, it’s important that you limit the number of treats that you give your puppy on a day-to-day basis, since maintaining a healthy weight is important for any pet’s health. It’s also important for puppy owners to know that not all treats are created equal. A lot of cheaper dog treats that you find in pet stores with big brand names are bad for puppies and use unhealthy ingredients. Luckily, with a little research you can find healthy treats that you can use that your puppy will love! Whether you’re housebreaking in a puppy or retraining an adult dog, here are the top five commercial dog treats for training puppies. 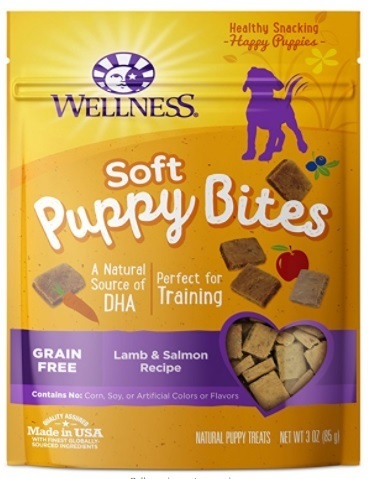 Wellness’ Soft Puppy Bites are natural and grain free puppy training treats. These treats are soft, chewy, puppy sized and are available in bags ranging from three to six ounces. If you’re looking for a healthy snack to feed your puppy, these Puppy Bites are made using all-natural ingredients. They contain no meat by-products, corn, wheat, dairy or any artificial colors and flavors. Dog owners can feel great giving these treats to their puppies because they’re made in the USA. They’re fortified with DHA for healthy brain development, antioxidants, and superfoods like veggies and blueberries. Puppies love these treats, but they are a little big and some owners like to cut them in half. It's easy to see why Amazon rates them as the best dog treats for puppies with a whopping 2000 positive reviews. At only 4 kcal/treat owners love the quality premium proteins and how well their puppies respond to training with them. 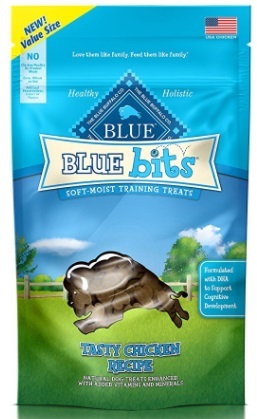 BLUE Bits Dog Treats are healthy and holistic, just like all Blue Buffalo products. These extra moist and soft chicken flavored training treats come in a nine-ounce bag. Owners can confidently give these treats to their puppies knowing that they don’t contain any meat by-products, corn, wheat, soy, or artificial ingredients that can cause health issues. To support your puppy’s health, these treats which are a low 3.5 kcals per treat are made with DHA to promote healthy brain development along with Omega 3 and 6 fatty acids to keep your puppy’s skin and coat in tip-top shape. Plus, they come in cute, perfectly bite-sized heart shapes! While some owners find these treats expensive, most love the quality and the size is great for puppy training. 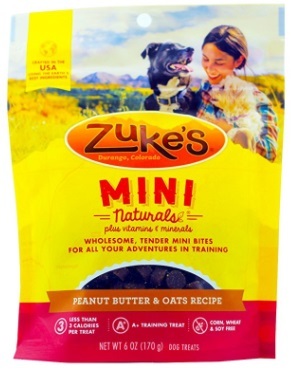 Zuke's Mini Naturals are wheat, corn, and soy-free peanut butter treats that are made in the USA. They come in six-ounce bags and are designed to be tasty, so your dog will love them. At only 3.5 calories per treat, these are a healthy option for training that won’t make your puppy gain an unhealthy amount of weight as opposed to some less healthy options out there. These dog treats are not only tasty and low-calorie, but also made with powerful whole food sources of antioxidants including cherries, rosemary, and turmeric. Owners love these treats because they aren’t messy, so they can be easily carried around in your pocket during training. They’re also great for dogs/puppies who suffer from allergies since they don’t contain common triggers like wheat ingredients. CANIDAE’s PURE Chewy Treats are grain free, limited ingredient treats made in the USA and perfectly sized for training purposes. These treats are available in several tasty flavors including Sweet Potato & Duck, Wild Boar & Cherry, and Turkey & Apple (to name a few). The exotic meats and ingredients are great for dogs who tend to be sensitive to more common meats like chicken and beef. 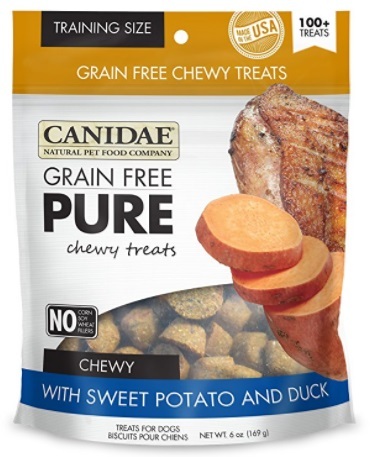 If you’re looking for a snack option for your pet without an extensive list of ingredients that you don’t recognize, CANIDAE PURE is the way to go. These also make healthy treats for larger breed puppy. They are also a low-calorie option at 3 kcals per treat, perfect for training yet keeping your growing puppy lean. While some of these treats contain chicken meal in them, overall, they are made with quality ingredients that owners trust and dogs love. 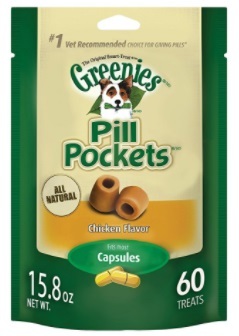 Greenies Pill Pockets are soft dog treats that you can use to help your dog take its medication. They are the #1 vet recommended choice for giving dogs pills, and they’re chicken flavored, so your dogs will even enjoy it! This is generally better than trying to give them their pills with human food. These all-natural bags of treats are low-fat and come with 60 pill pockets that have an opening to insert the pill. Once the pill is inserted into the pocket, you can squeeze it shut so your dog won’t end up eating the treat and not the pill. Chicken is the first ingredient in these treats, which is great, but there aren’t many other whole food ingredients, so they should be given in moderation. Owners love these treats though, because they make it easy to guarantee that their dogs are getting the medication they need. In addition to packaged treats like the ones we mentioned above, consider experimenting also with snack-sized string cheese, dried apple pieces, sliced carrot, skinless chicken (lower in fat and calories), sweet potato chips and any homemade dog treats you might have and that are safe for your puppy to eat. Avoid giving your puppy any food containing chocolate, cocoa, onions or any foods that contain high levels of salt and fat. See our related article about other popular human foods to see which are safe and which aren't for your pup to eat: Can I give my dog bananas? and Should dogs be allowed eat avocado? Also check out our in-depth review into the best puppy foods. Bottom Line.... What are the Best Treats for Housebreaking a Puppy? Treats are great to use when training your dog or rewarding them for good behaviour, but it’s always important to use them in moderation and as part of a balanced diet. Although there are a lot of inexpensive treats in grocery and department stores, they aren’t always high quality. It’s important to pay attention to the ingredients, which are generally listed in order of weight. Some important things to look for in dog treats are quality meat ingredients, whole foods, and natural preservatives. Generally, buying locally is best because different regulations in other countries could mean that they use less healthy ingredients. Things to avoid when looking for quality dog treats are artificial ingredients, meat by-products, and ingredients like wheat and soy that can trigger allergies. 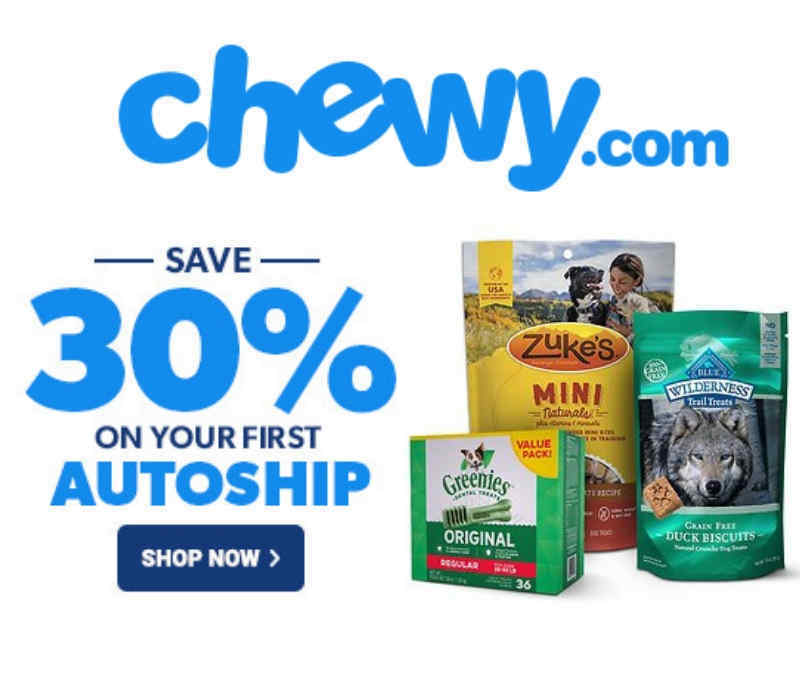 In this healthiest dog treat review, we analyzed the best dog treats for training puppies and reviewed the most popular brands, it's now up to your puppy now to do a taste review and let you know which treat he or she liked the best! These all sound great, we haven’t tried any of them, will definitely look out for them for Merrie to try.